Headline: The How2BecomeAChristian.Info RADIO SHOW with Damon Whitsell AND a very special Guest: YES affirmation to Title Questions. Jan.6 10pm Central http://blogtalkradio.com/How2BecomeAChristian. United States of America (Press Release) January 4, 2009 — As one witchcraft site says,,, “The differences between the Christian and witchcraft viewpoint is the difference between being citizens of a society which takes an active role to shape and mold the structure of society or subjects of a society which has the connotation of subordination to the larger group for the benefit of all. A similar term with very different meanings between Christian and pagan understandings of the word is “self-control”. To those practicing witchcraft they believe that they are the one who has full control over the actions. They do not surrender to another except under very brief, special and voluntary circumstances. Self-control means taking charge, making all decisions relating to oneself, doing anything so long as it doesn’t hurt someone else. Subtopics: 1. COULD IT BE THAT?, Americans and the World are now paying the consequences of a false “prosperity gospel“, through economic crises and outrageous personal debt? What will be the end result? 2. Honest, sincere people read and seek the truth. Scared people hide from truth? In PART ONE of the series, John and Damon will examine the biblical warnings to beware of false teachers/prophets and BE NOT deceived, because one day God will send a delusion into the world, upon those who love not His truth. They will be delving into the History and Occultic/New Age/Luciferian roots of the Word of Faith Movement. And will be discussing Cult Psychology (why people fall for cults and cultic teachings, including mind control techniques). Do your ears itch? Special Topic Press and Listener Release: The How2BecomeA Christian.Info Radio show with Damon Whitsell AND a very special Guest: Topics; 1. Have American Christians accepted a false gospel (that is really occultic witchcraft) because they have itching ears for what they want to hear and not a love for God’s Truth? Are some “Christians” practicing Witches, Unaware? 2. Have ”Word of Faith Preachers” and “Word of Faith Believers” contributed to American National Debt and financial woes? Headline: The How2BecomeAChristian.Info Radio show with Damon Whitsell AND a very special Guest: Topics; 1. Have American Christians accepted a false gospel (that is really occultic witchcraft) because they have itching ears for what they want to hear and not a love for God’s Truth? Are some “Christians” practicing Witches, Unaware? 2. Have ”Word of Faith Preachers” and “Word of Faith Believers” contributed to American National Debt and financial woes? This segment episode of The How2BecomeAChristian.Info Radio show with Damon Whitsell AND a very special Guest: “Have American Christians accepted a false gospel (that is really occultic witchcraft) because they have itching ears for what they want to hear and not a love for God’s Truth?”,, will air on January 6, 2009 at 10 p.m. Central Time. It will be informative, exciting, socially and personally challenging to Christians and non Christians alike.. The show will feature both Show Host Damon Whitsell and Special Guest Ex-Word of Faith Preacher; John Edwards, YES AFFIRMATION,, to the title and subtitle questions. They will offer an examination of what the Bible and Jesus have to say about false teachers and guarding against deception in the last days. A historical and theological critique of the WoF movement that has been all the rage in “big Christianity” and most Charismatic Circles. They will compare the “Word of Faith” teaching that faith and words are a “creative force“, with the exact same occult teaching that has always been the corner stone of witchcraft and the occult. As one witchcraft site says,,, “The differences between the Christian and witchcraft viewpoint is the difference between being citizens of a society which takes an active role to shape and mold the structure of society or subjects of a society which has the connotation of subordination to the larger group for the benefit of all. Read this for your own good. The Evil of Usury ß link The TV Word of Faith Ministers are not the only ones USING YOU and Us. “Who goeth a borrowing goeth a sorrowing” — Benjamin Franklin. In PART TWO of the series, John and Damon will also play and critique audio clips from prominent Word of Faith Teachers false, heretical, aberrant and damnable teachings. And Damon has some tough Questions for John as he will play devils advocate with John to wrap up the second show. Both Damon and John have been strongly affected by the Word of Faith movement and have much to say on the subject. Damon’s take on the Word of Faith Movement is: “Because my uncle is a Mormon bishop, I have studied the occult extensively. All secret occult groups have one thing in common, freemasonry as a recruiting ground. AND as several prominent freemason writers have claimed, the Cabbala is the source of freemasonry and all of the ancient mystery religions. It just blows me away, and testifies to the veracity of the bible and its end time apostasy claims, in that so many today would agree with Satan (believe lies taught by demons) in saying Genesis 3:22 (And the LORD God said, Behold, the man is become as one of us, to know good and evil: and now, lest he put forth his hand, and take also of the tree of life, and eat, and live forever) is their favorite bible verses. I know not many say it is their favorite verse, but the Word of Faith movement (WoF) stuff falls apart without it, Gen3:22 is what it is built on.Gen3:22 is known as the occult secret doctrine. BUT in occult circles, this so called occult truth, is only for the adept, initiated and illuminated. Freemasonry and other occult traditions practice secrets within secrets and secret groups within secret groups. These groups are split between the adept and the un-adept. SO your average WoF believer is more adept to occult teachings than most freemasons and members of other occult groups. An archive will be available at the same link immediately following the show or listeners can subscribe to the archives via the RSS feed located on the same host page. The How2BecomeAChristian.Info Radio show with Damon Whitsell and it’s sister sites are a How2BecomeAChristian.Info (with a numeral 2) Ministry. How2BecomeAChristian.Info (with a numeral 2) Ministries are websites primarily devoted to answering the question “How to become a Christian?” The site focuses on Christian essentials but also covers all non essential doctrines and issues concerning Christianity and religion in general. Including all non/Christian religions, aberrant Christian cults, the Occult, the New Age Movement and much more. The ministry serves as an apologetic information portal, equipping you with the information you need to defend God’s word and the historical./orthodox Christian faith; while reaching out to those who need to be reached. The sites feature the research and writing of other bible students. BUT is the main source for publishing (Ministry Manager) Damon Whitsell’s personal bible studies and research. The show is live every Tuesday night at 10 p.m. Central Time. The show is hosted on BlogTalkRadio (BTR). !!! BlogTalkRadio is a free, web-based platform which allows any user with a phone and a computer to host a live, interactive Internet broadcast. Hosts call into the service by phone, managing callers on the web-based host dashboard. Shows stream live directly from the host’s BlogTalkRadio web page with archives available for all past shows. BlogTalkRadio has been featured on ABC News, The Washington Post, Portfolio, Talkers Magazine, and TheStreet.com. The citizen broadcasting network can be found at http://www.blogtalkradio.com. Welcome to the first How2becomeAChristian.Info RADIO show on BlogTalkradio. I met John about 1 ½ months ago when he commented on my blog. I was intrigued by his blog and video and started to reproduce some of his blogpost right away. Being a Rhema Bible Training Center graduate, Kenneth Hagin student and an ex-word of faith preacher, John has much to say about the word of faith movement. It has been about a years since john left the WoF and he has blogged daily at his blog FaithPreacher.blogspot.com,,, Johns blog has the making a very good book. Take a look and tell me what you think. The show will feature questions and answering session to John Edwards and the show host Damon Whitsell. John has a passion for helping folks so why not join us and ask some questions and invite your Word of Faith friends to listen and join in. 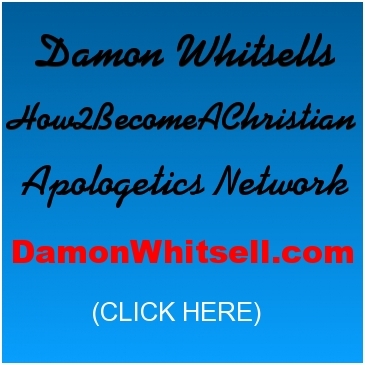 COME Join in the LIVE BlogTalkRadio Christian Apologetics Discussion Show, How2BecomeAChristian.Info RADIO w/Damon Whitsell on Tuesday nights @ 10PM central time. Starting Jan. 6 2009. The show features special guest in the field of Christian apologetics and other Christian fields of study, thought and practice. You can call in @ (347) 215-6795 when the show is on air, and participate or chat with other listeners in an interactive chat room. Come state your beliefs or defend them. Ask questions, ir your grievances or just say Hello. The live Shows will also be archived for listening, downloading and podcasting at BTR. Click the BTR LOGO button. Hope to see you there! There are also RADIO SHOWS that are not available at BTR. Check out our other H2bac.Info RADIO media distribution site at the flashing logo, for shows that cannot be aired at BTR. Don’t forget to sign up for show email reminders at BTR, and Check out the sister sites!!! I made up some sound clips and stuff to finish off the first John Edwards show, BUT John and I recorded a 30 minute talk we had and I attached it to the show I already had. John invited me to ask any and all questions,,, and even to play devils advocate. So I will soon have a second show with John that will be and even better interview than this first one. This is my interview with researcher and writer Peter Goodgame. In 2005 I went to the Ancient of days bible prophecy conference in Roswell New Mexico, I met Peter and many other really neat people there. Peter is the author of the book Red Moon Rising; The Apocalypse and the rapture timeline. He also owns the site redmoonrising.com. Peter is an excellent researcher and writer. I have a couple of his articles posted on this blog,,, but most of Peters writings are very detailed and lengthy. BUT they are very worth the time to read. They are just a little too long for this blog. Here are the Peter Goodgame articles, on this blog and it’s sister blog,,, to encourage you to check out his site and his other prime grade research writings. The How2BecomeAChristian.info RADIO SHOW will begin to air on BlogTalkRadio on January 6 at 10pm central. The show will be a mix of pre-recorded live shows and live call in shows. The show will feature interviews with well known Theologians and other professionals in various fields of Study. First up will be Ex-Word of Faith Preacher John Edwards from FaithPreacher.blogspot.com AND Christian Ufologist Guy Malone from alienresistance.org The shows will also do other things besides interviews. I will schedule ONE SHOW a month for people to air their grievances in a live format. There is NOW a rough draft of a preview show with Pastor John in which I use audio from his video on his site, available for your listening (click the LOGO above). To let you know what to expect. The full and finished show will be finished and released in a few days. I will have MY INTERVIEW with pastor John coming in 1-2 weeks. There will be 3 points of distribution for the How2BecomeAChristian.info RADIO SHOW and it’s Sister show OccultAgendaExposure.Info RADIO which will start sometimes in February. 1. BlogTalkRadio. The shows can be viewed and participated in at this URL http://www.blogtalkradio.com/How2BecomeAChristian The shows will also be available for download and listening there. 3. ALL shows will be broadcast from a respective BLOGPOST for that show episode. Wishful yet hopeful: Justin peters, Sandy Simpson, Rick Ross, biblical truth for Mormons, Mormon curtain, 20 truths about Mormonism, Keith and Lorrie Macgragor, and their Trinitarian friend, Ed Decker, Sharon and Derrick Gilbert at peering into the darkness, PID RADIO, Russ Disdar at shatter the darkness, Christ White No Where to Run from Revere Radio Network and Revelation Radio, Ron Rhodes: Reasoning from the Scriptures ministries, Sharon and Derrick Gilbert at Peering into the Darkness PID RADIO, Russ Disdar at Shatter the Darkness, Chris , James Spencer at Maze Ministry, Matt Slick at carm, Kirby Anderson Probe Ministries. MORE TO ADD SOON. If you would like to submit a name or ministry to this list. Please leave the name or ministry name in the comment field below. How2BecomeAChristian (with a numeral 2) ministries is a Christian Apologetics Ministry primarily devoted to answering the question “How to become a Christian?” The ministry focuses on Christian essentials but also covers all non essential doctrines and issues concerning Christianity and religion in general. Including all non/Christian religions, aberrant Christian cults, the Occult, the New Age Movement and much more. All material produced by How2BecomeAChristian (with a numeral 2) ministries IS LICENSED for your FREE USE under Commons Copyright Licensing.